The Mobile-911 Live Demo is meant to quickly demonstrate the functionality of Mobile-911. Within minutes the user can download the app, connect it to an alarm server located at WIN-911 Software’s headquaters, and get a live demonstration of a remote alarm notification. The user even has the ability to interact with the alarm server. The following steps walk the user through downloading, configuring, and using the live demo. 1. From your iOS device open the App Store and search for Mobile-911 or use the QR code below. Download and install the app. 2. From your Android device open the Play Store and search for Mobile-911 or use the QR code below. Download and install the app. 3. From your BlackBerry device open App World and search for Mobile-911 or use the QR code below. Download and install the app. 1. 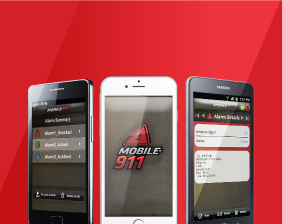 Open the Mobile-911 app , tap OK to Set Up the Device. 2. Tap on Primary Server (not configured). Tap Save. You should see a message appear saying Device Connected to Primary Server. Tap OK.
4. There’s no need to send the Mobile-911 Code since the demo server registers it as soon as it connects. Tap Done on the Set Up Device screen. Note: The user will need to use the Mobile-911 Code when setting up Mobile-911 with their existing WIN-911 System. 1. Tap Settings, then select Ack Code (no ack code). Mobile-911 will require an ack code every time the user acknowledges an alarm. To avoid this, enter an acknowledge code here. WIN-911 Software’s Mobile-911 demo server will accept any acknowledgement code. Click Save. 1. To begin receiving alarms from the demo server, tap Alarms, then tap Request Alarms. Select All Alarms. The client should receive an alarm message immediately, with more alarms to follow. The Mobile911 app will receive alarms for the next 5 minutes. If no actions are taken within 5 minutes the client will automatically disconnect from the server. Alarm details can be viewed by tapping on an alarm in the Alarms window. Alarms can be acknowledged by tapping the Ack button in the Alarm Details window. 2. To request a report, go to the Reports tab and click on the report name linked to report number 1. The report should populate with 10 items.